Hoy, Gene y yo fuimos de compras a Sprouts. Nunca he ido, pero mi hermana, Kaitlin, le gusta y yo quería ir. Sprouts es interesante. Las naves son cortos entonces, se puede ver toda la tienda en contraste de las tiendas como Safeway o Albertsons. Sprouts tiene mucha comida orgánica para las personas que les gusta ese. No pude encontrar todo que quería y unas cosas eran caras. Sin embargo, muchas verduras eran baratos. El brócoli sólo costaba $0.99 por cabeza. Pienso que es bueno. Damos un paseo también. El tiempo es perfecto hoy. No puedo creer que es octubre. Mientras caminando, Gene y yo pasamos por un graffiti de Inigo Montoya. Gene lo encontró hace un rato pero hoy es el primer día que podría tomar una foto. No sé si el dibujo significa algo pero pienso que es guay. Today, Gene and I went shopping at Sprouts. I had never been, but my sister, Kaitlin, likes it and I wanted to go. Sprouts is interesting. The aisles are short so, one can see the entire store as opposed to stores like Safeway or Albertsons. Sprouts has a lot of organic food for the people that like that. I couldn’t find everything I wanted and some things were expensive. Nevertheless, many vegetables were cheap. The broccoli only cost $0.99 a head. I think that’s good. We went on a walk as well. The weather is perfect today. I cannot believe it’s October. 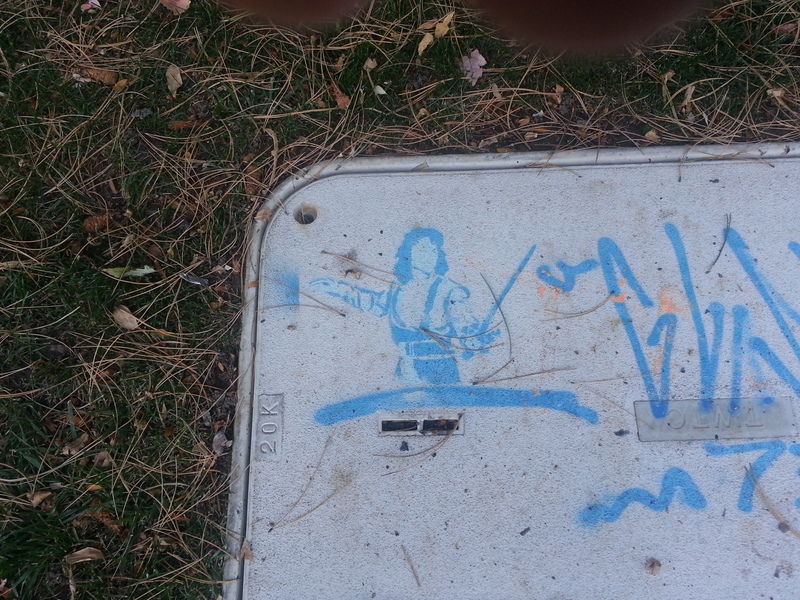 While walking, Gene and I passed by a graffiti of Inigo Montoya. Gene found it a while ago but today is the first day I could take a photo. I don’t know if the drawing means anything but I think it’s cool. Yay for English translations! We’re having a murder mystery party in December, I wish you two could come to it! I have Denver on my weather app as a favorite city to see what the weather is like for you, and I see more snow is headed your way! Hope you’re staying warm! Miss you! Yeah, I saw it was supposed to snow. Hopefully it’ll last only a day. I have my boots ready just in case! Loved your recipe about the apple bread, I hope to make it someday!